The debate over teaching evolution in the public schools remains one of the most emotionally charged controversies in twentieth-century America. 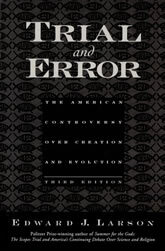 The newly revised third edition of Trial and Error, Edward J. Larson’s highly acclaimed study–which ranges from before the Scopes trial of 1925 to the creationism disputes of the 1980s–offers the first comprehensive account of the educational and legal battles erupting from this persistent confrontation. This updated classic work presents a balanced historical interpretation of legal and educational debates over evolutionism, and will appeal to those interested in the fields of history, religion, science, and law.